Why do many galaxies appear as spirals? A striking example is M101, shown above, whose relatively close distance of about 27 million light years allows it to be studied in some detail. Observational evidence indicates that a close gravitational interaction with a neighboring galaxy created waves of high mass and condensed gas which continue to orbit the galaxy center. These waves compress existing gas and cause star formation. 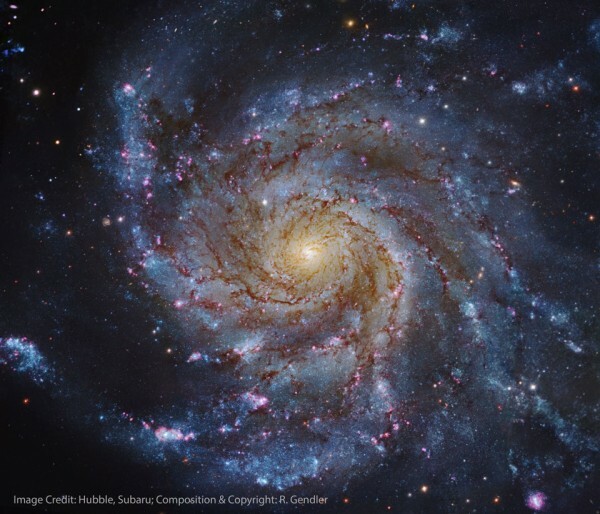 One result is that M101, also called the Pinwheel Galaxy, has several extremely bright star-forming regions (called HII regions) spread across its spiral arms. M101 is so large that its immense gravity distorts smaller nearby galaxies.